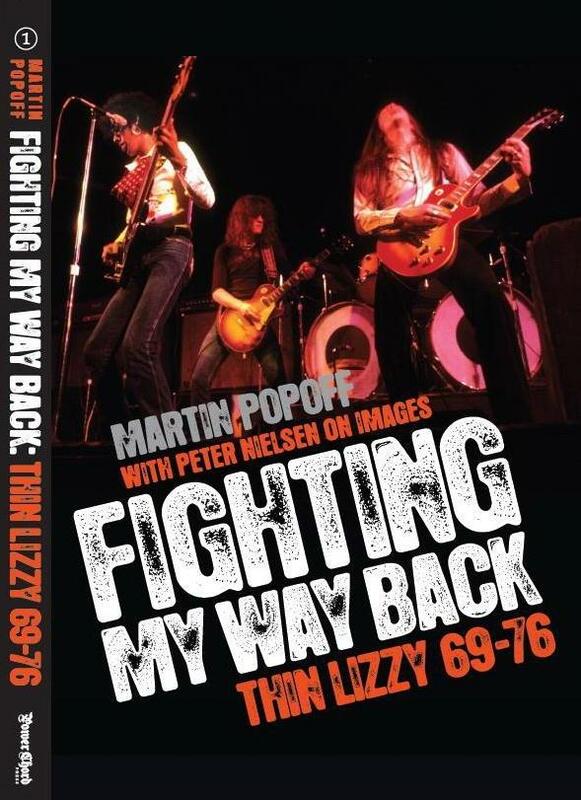 Schlock-Wire: Don’t Miss Out On Martin Popoff’s New THIN LIZZY 69–76 Biography! – Schlockmania! Dublin’s Thin Lizzy have become one of the most revered cult acts of all time, studious and discerning fans of hard rock the world over reveling in the storytelling acumen of the legendary Philip Lynott and the craft and class of his band. 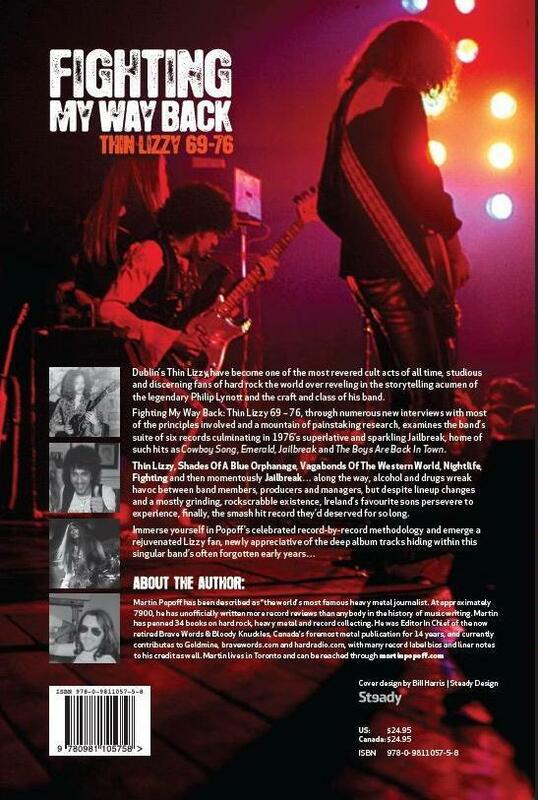 Fighting My Way Back: Thin Lizzy 69 – 76, through numerous new interviews with most of the principles involved and a mountain of painstaking research, examines the band’s suite of six records culminating in 1976’s superlative and sparkling Jailbreak, home of such hits as Cowboy Song, Emerald, Jailbreak and The Boys Are Back In Town. Thin Lizzy, Shades Of A Blue Orphanage, Vagabonds Of The Western World, Nightlife, Fighting and then momentously Jailbreak… along the way, alcohol and drugs wreak havoc between band members, producers and managers, but despite lineup changes and a mostly grinding, rockscrabble existence, Ireland’s favourite sons persevere to experience, finally, the smash hit record they’d deserved for so long. The book’s 280 pages include 328 rare, archival black & white photos and memorabilia shots to accompany my usual in-depth track-by-track play-by-play type o’ crazy biog. Fresh new interviews for this book included (and most a few times), Eric Bell, Scott Gorham, Brian Downey, Gary Moore and Brian Robertson along with a couple of managers in Terry O’Neill and Ted Carroll, producers Nick Tauber and Ron Nevison, Nigel Grange from Vertigo, Frank Murray who kept it all together on the road, cover artist Jim Fitzpatrick, and a range of others. As well, historical press interviews helped bring out the real Phil in all his dastardly guises. When I say rare, it’s rare that an interview with me is transcribed! So hail to George Pacheco. I appreciate the effort, as I transcribe interviews all the time and I know how long it takes. Our chat was set up around my Fighting My Way Back: Thin Lizzy 69-76, but a lot of it revolves around Thin Lizzy’s music and career moves, good an’ bad. Matthias Mader, Publisher Iron Pages (Iron Pages have published German editions of my Dio, UFO, Rainbow and Sabbath books, with Deep Purple out shortly). OK, the usual… books will be signed by me to you so let me know if it’s a present. Email me at martinp@inforamp.net with any further questions, and see www.martinpopoff.com for descriptions, cover art and ordering info for my other available 30 or so books. Nice savings on shipping can be had if you take a few things, and as you know, I’m always good for swingin’ a deal for two books or more. Just ask. Next ArticleSANTA CLAUS (1959): Kris Kringle Is A Satan-Fighting Superhero? It´s been magic to have been involved with this book. Thanks for writing in, Peter. I ordered my copy of the book yesterday and look forward to checking out the images you provided for it.